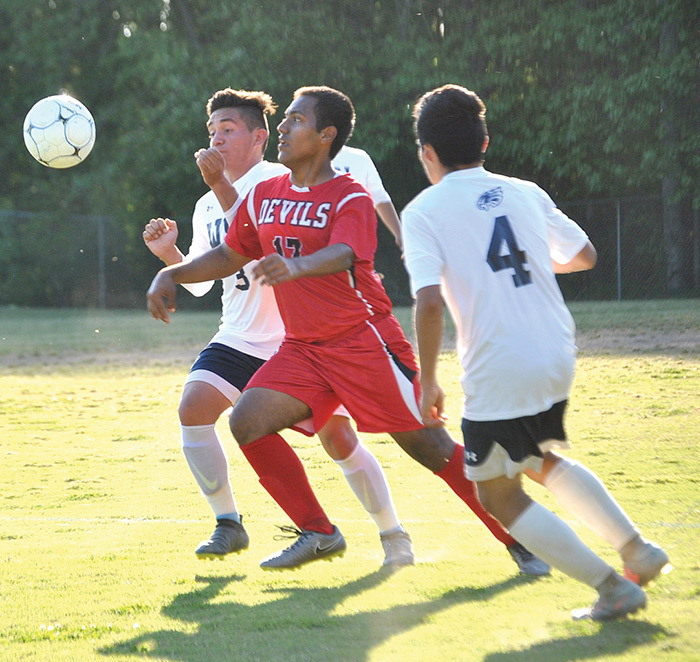 Lancaster capped a 6-4-2 regular season for seventh-place in Region 1A varsity boys soccer with a win and a tie against Northern Neck District teams last week. Hunter Koonce scored Lancaster’s only goal last Friday in a 1-1 tie with Northumberland to end regular season play. The Red Devils and Indians had played to a 0-0 halftime tie before NHS took the lead, 1-0, early in the second half. Koonce tied the game with an unassisted shot and both overtime periods ended scoreless. The Devils pounded the Indian defense, taking 25 shots. Henry Smith had nine. Koonce took eight and Evan Steensma, five. LHS goalkeeper Nathan Spiers had 18 saves. The Devils picked up a 3-0 win over Washington & Lee last Wednesday with Smith scoring two goals and Koonce one. Sheridan Ford, Koonce and Smith recorded an assist each. Spiers had seven saves. Freshman keeper Adrian Henderson went in to make one save for LHS. Bruton edged Lancaster, 3-1, last Monday in a non-district outing in Williamsburg with Koonce scoring the Devils’ lone goal on a free kick. Lancaster was scheduled to host Northumberland in a first-round Northern Neck District tournament game May 16 with the championship game scheduled for May 18 at Rappahannock. Lancaster ended regular season play just behind Rappahannock at the top of the district ladder. The regional tournament begins Wednesday, May 23. As a high seed, Lancaster will host a first-round game. The tournament continues at the higher seeds May 25 and 30 with the championship game scheduled June 2 at the high seed.